The badger SOTAR 20/20 is a dual action, internal mix, gravity feed airbrush. SOTAR stands for State Of The Art Results and I think that Badger is not far off with this airbrush. The SOTAR 20/20-2F airbrush comes with its .21 needle and will allow you to paint very fine details work. It is capable to provide professional illustrator the ultimate fine line detail. Originally released in the mid 90’s to compete with the great Custom Micron series airbrush from IWATA, the Badger SOTAR 20/20 offers one big advantage over the IWATA airbrush: the price! 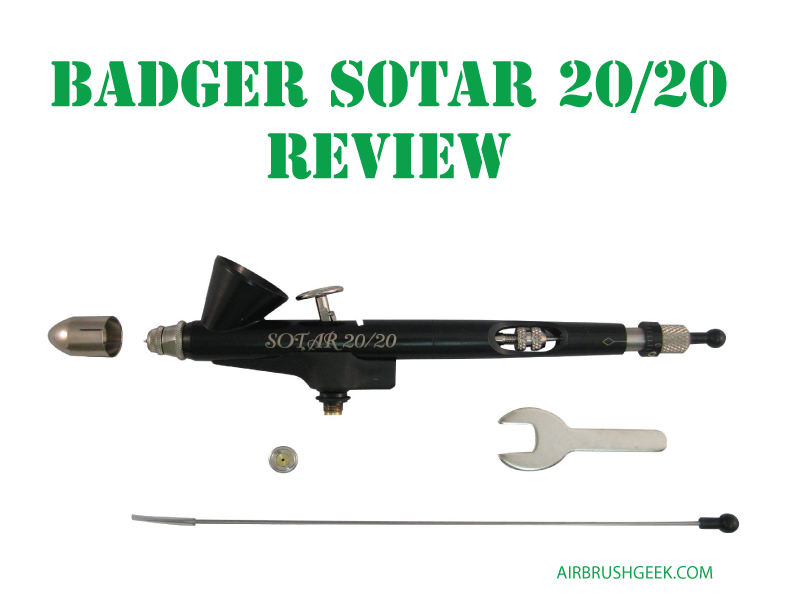 For those who don’t necessary have the funds to buy a rather expensive IWATA hairbrush, this Badger SOTAR 20/20 airbrush comes as a blessing as this airbrush is very well price for a product able to achieve such great details work. The fine head .21 mm has a black plastic knob at the back of it. The medium head .45 mm has a white plastic knob at the back of it. The heavy head .70 mm has a clear plastic knob at the back of it. The Badger SOTAR-2H comes with the heavy head (.70). You can use the different needle size on the same body at the condition that you are using the corresponding paint tip and spray regulator. Gravity feed, dual action, internal mix airbrush; The SOTAR was designed by an elite team of professional artists and illustrators. Micrometre setting allows user to preset desired spray pattern; Multi patented design including rear needle release. The Badger SOTAR 20/20 has a nice black finish. Users will be happy to know thought that the inside of the cup is not black but silver, making it easier to clean the residual paint. The badger SOTAR 20/20 is a little be lighter that the Badger Patriot 105 and also feel a bit different in hands probably because it has a shorter nose than the Patriot or the Krome Airbrush. But because of its shorter nose, it makes it easier for you to view where you are spraying, making the SOTAR 20/20 even more suited for those users that are working on very fine details Overall, I got used to it pretty quickly. The Badger SOTAR 20/20-2 comes with a 1/12 ounce cup as oppose to the original SOTAR 2020/-1 that came with a much smaller paint cup. The SOTAR 20/20-2 comes also with a spare needle. Note that it is shipped with a needle guard now, which offers a little extra needle protection always welcome when using such a thin needle. It is equipped with the same black plastic finger rest as the Badger Renegade Krome , feature that, I feel give that extra bit of comfort when spraying. The Badger SOTAR 20/20’handle has a cut away design, so untightening the needle chuck at the back will allow you to remove the needle, without having to remove the handle. You can adjust the trigger tension from medium to light using the retaining spring screw. You can also adjust the paint flow using the paint adjusting flow screw. Basically, if you move that screw forward, you can reduce the trigger movement little by little until any trigger movement impossible. For a maximum paint flow, loosen the paint adjusting screw so that it touches the black plastic knob at the end of the needle. This unique feature from the Badger SOTAR 20/20, the control on the paint flow, make it easier for you to control the thickness of the lines you are spraying. This make it the perfect airbrush for highlighting, shading or weathering for modellers. At that stage you have probably understood that the Badger SOTAR 20/20 is really a great brush for those who want to be able spray really fine lines. Of course, to achieve good result in spraying fine details, you will always need to make sure the paint you are using has been properly thinned before using it on the Badger SOTAR 20/20. Another crucial factor is the air pressure. Make sure that you air pressure is low enough (approximately 20 PSI or even lower then that) to be able to control the flow of paint Failure do to this could result to spidering defects. All of that can sound a bit complicated for a beginner but with a little practice, you will be able to get the right paint consistency and find the right air pressure for the type of work you want to do. I wouldn’t recommend though the Badger SOTAR 20/20 for any priming and solid colour jobs. Keep the SOTAR for fine details jobs and maybe use an alternate airbrush for job that need larger coverage. The SOTAR 20/20 is another really good brush from Badger. The SOTAR is a great brush for fine work. It wouldn’t necessary be an airbrush aimed at beginners but maybe more suitable for more experienced users that want to take it to a step higher. The price of the SOTAR 20/20 is also a high point.The SOTAR 20/20 is sold at a very competitive price compared to competitor airbrushes that can do similar kind of fine detailed work. So if you can’t afford a IWATA Custom Micron airbrush, then I would go for the SOTAR 20/20. Overall, I can only highly recommend this airbrush and I give it another 5 stars !